According to Eq. (15), the sun's declination varies between and during the course of a year. It follows from Eq. (34) that it is only possible for the sun to have an upper transit at the zenith in a region of the earth whose latitude lies between and . The circles of latitude bounding this region are known as the tropics. Thus, the tropic of Capricorn--so-called because the sun is at the winter solstice, and, therefore, at the first point of Capricorn (i.e., the zeroth degree of Capricorn), when it culminates at the zenith at this latitude--lies at . Moreover, the tropic of Cancer--so-called because the sun is at the summer solstice, and, therefore, at the first point of Cancer, when it culminates at the zenith at this latitude--lies at . Equations (34) and (35) imply that the sun does not rise for part of the year, and does not set for part of the year, in two regions of the earth whose terrestrial latitudes satisfy . These two regions are bounded by the poles and two circles of latitude known as the arctic circles. The south arctic circle lies at . Likewise, the north arctic circle lies at . 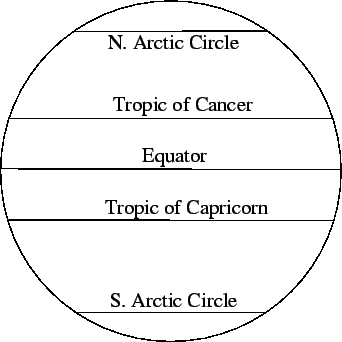 The equator, the two tropics, and the two arctic circles constitute the five principal latitude circles of the earth, and are shown in Fig. 12. Figure 12: The principal latitude circles of the earth.